Based on the smash hit, award-winning animated television show produced by Hasbro Studios on The Hub Network, TRANSFORMERS PRIME lets fans play as their favorite AUTOBOT characters and embark on an action-packed adventure to save the earth from the evil MEGATRON and his new secret weapon. In the single player campaign, players will step into the roles of OPTIMUS PRIME, BUMBLEBEE, ARCEE, AUTOBOT RATCHET and BULKHEAD as they explore unique vistas all around the world with brawler-style combat and diverse driving sequences. 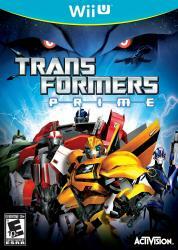 Along the way, gamers cultivate friendships with Jack, Miko and Raf � the human characters from the show � as TEAM PRIME sets out to protect mankind and eliminate the DECEPTICONS once and for all. The game also features intense multiplayer modes that allow fans to choose from 11 different TRANSFORMERS characters from both factions.